Updated for July 2007! It's about time that Microwaves101 built up some content on amplifier designs. We now have a MMIC LNA photo to discuss below. We'll point out some of the features and provide some pointers on reverse engineering it! Fellow microwave Dudes, we can always use more photos of microwave hardware. Send us a picture and you'll receive a cool Microwaves101 pocketknife! Be sure to ask the owner of the photo (your company!) for permission. As Yoda might say, "near the input of any receiver a low noise amplifier, positioned there is". That reference was a tad random, but keep going, we will. It's possible that some type of filter, duplexer and/or receiver protection device is between the LNA and the antenna, but nothing else. The primary characteristic of an LNA is its noise figure, which is a measure of how much the LNA degrades the signal-to-noise ratio of the received signal. Other important characteristics of and LNA are its linearity (measured in P1dB or third order intercept), and its survivable power, its DC dissipation (particularly important in battery-power wireless devices, and satellite systems). 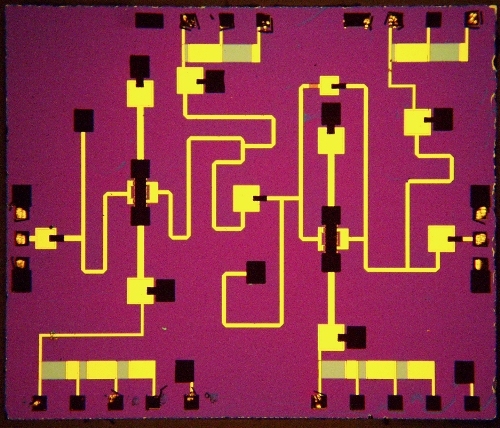 Here's an image of a two-stage LNA from a MMIC factory that is now probably rubble under a WalMart. It illustrates series feedback, parallel feedback, self biasing using grounded gates. The active elements are FETs, or perhaps PHEMTs. This is not an HBT circuit. Can someone send us an image of an HBT ciruit please? This two stage circuit is probably X-band. How do we know that? The length of the series feedback lines on the FETs seems right for X-band, go look at some X-band LNA layouts at TriQuint and you'll see what we mean. On the other hand, those small RF bond pads could fool you into thinking that this was a millimeterwave part. If the probe pitch at the GSG interface is 150 microns (it probably is), the pads are only 75x75 microns. If this was an X-band circuit the designer should have made room for two wire bonds on one pad, this is impractical for MMW because the bond-pad capacitance will be hard to overcome in a matching network. We think that this was a non-production design, not meant to be wirebonded, just RF probed. The bright gold is probably sputtered, if it was plated it would appear rougher. This metal is used to form the transmission and bias lines. Nowhere on the chip is an obvious 50 ohm line (often you'll see one at either input of output, used to stretch the design to fit a certain grid spacing) but we can speculate that the line impedance of most of the T-lines is higher than 50 ohms (probably 70-80 ohms) to a facilitate inductive tuning networks. Speaking of tuning, it looks like lumped capacitors have all been sized so that they are near-short circuits to RF and therefore not used as major tuning elements. This could indicate that the foundry that made this product had a bad reputation for variability in capacitor dielectric thickness. There are two types of resistors on the circuit. The most obvious are probably tantalum nitride metal resistors and appear as gray rectangles that are connected between the bias pads (source and drain resistors). These are on the order of 10 to 50 ohms per square (depends on how thick they are). The other type of resistor is a mesa resistor which is used to achieve much higher sheet resistance values. There is only one mesa resister, it is in the parallel feedback path on the second transistor, to the left of the feedback capacitor. The dark metal on the circuit is the final plated metal. It is used at bond pads, and to create air-bridge connections from the tops of the capacitors. Often people are called to a design review for circuits such as these to point out improvements that the designer might have missed. If we attended the design review for this chip we would have pointed out a few minor things. There should be some lettering (at least some numbers) on the bias pads to assist the assembler. The row-column numbers are missing which are needed to track known good die after RF probing a wafer. This is an indication that it was not regarded as a production-ready design. Also we don't like the input and output blocking caps that close to the RF bond pads where they might receive some tool damage, but often this is unavoidable. At least on the output cap we would suggest that the airbridge connection be moved to the other side of the cap to get it farther from the wirebonding area. Pass the donuts! 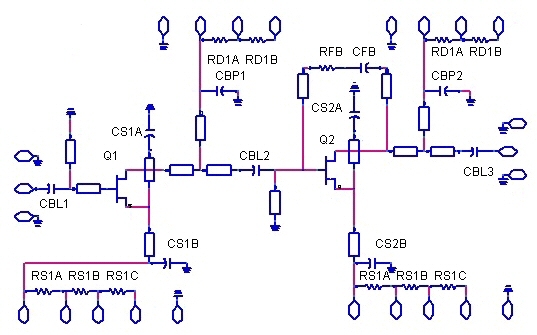 Here's a schematic of the amplifier. We created to help explain what is going on in an LNA design. This is a great example, it uses grounded-gate self biasing, series and parallel feedback, and resistor networks for bias adjustment! The blocking capacitors CBL1, CBL2 and CBL3 serve as near-short circuits to RF but allow the FETs to be properly biased at the DC quiescent point. The source bypass capacitors (CS1A, CS1B, CS2A and CS2B) provide RF grounds to the FETs yet allow the opportunity to provide source resistors to set the bias point. The series feedback on the source of the FETs allows the input match for best gain to coincide with the input match for lowest noise figure. This is negative feedback, the more feedback you introduce the lower the gain of the device, so it's a double-edged sword. The designer used series feedback on both stages, usually it is not required on the second stage (at least to the same degree as the first stage). We think that the designer stuck with series feedback on the second stage only out of convenience, he/she probably had measured de-embedded data on the feedback FET. By doing this, the design gives up a few dB in potential gain, we would have decreased the feedback on stage two. Parallel feedback is used on the second stage of the design. This technique can be used to "burn off" a ton of available gain below the band, with less effect within the band where you want to maximize gain. This is also a negative feedback, because there is a 180 phase shift between the AC voltage on the gate terminal and the AC voltage on the output terminal. You can to keep the feedback path quite short, or somewhere north of your frequency band it might become positive feedback and the amp becomes an oscillator! 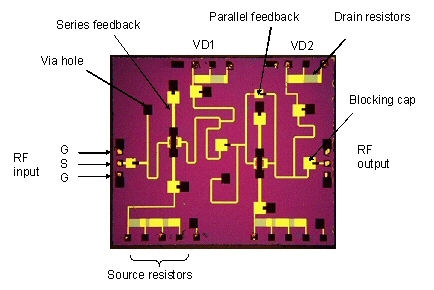 Parallel feedback is never used on the input of a good LNA, it degrades the noise figure of the stage. This amp is no exception. The bias point of a FET requires a slight negative potential from gate to source. When the source is DC grounded, this is done with a power supply connected to the gate terminal. For an PHEMT LNA this voltage might be -0.6 volts. Another way to get the gate-source voltage to -0.6 volts is to ground the gate, and raise the source potential to +0.6 volts by use of source resistors. If the FET stage requires 15 mA DC current, the source resistor needed is 20 ohms. The design we are discussing has three choices for source resister on board the chip (RS1A, RS1B and RS1C in the first stage, connected by grounding the appropriate pad). There is also the opportunity for an off-chip source resistor using the left-most source pad. There is further description of self-biasing techniques on our FET page. 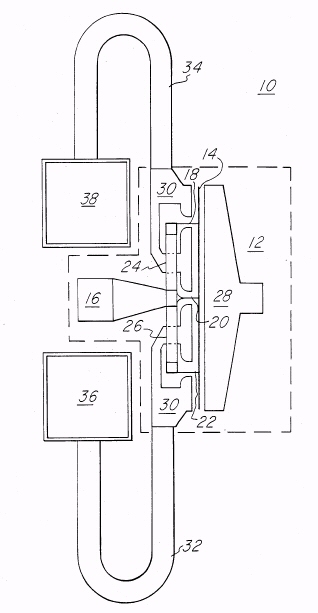 This cool concept is actually covered in U. S. patent 4,614,915, Monolithic series feedback low noise FET amplifier by inventors Heston and Lehmann, 1984. These two Texas cowboys discovered that by adding series feedback to the source of a FET, it is possible to move the input impedance match for lowest noise (ZOPT) very close to the input impedance match for maximum gain (S11*). It looks like the assignee of the patent (Texas Instruments originally, probably TriQuint by now) never tried to enforce it, nearly all LNAs use this technique today and few designers know that it is patented! Here's an image we cribbed from 4,614,915. The series feedback lines are 32 and 34 which connect the source (24 and 26) to vias to backside ground (38 and 36). Note that this FET has but a single gate finger (it's vertical, fed by 16). One thing that the inventors didn't think of was to use bypass capacitors to establish RF ground to the source, this design can't be self biased with source resistors like the MMIC LNA we discussed.